jumped in 2011 as well. 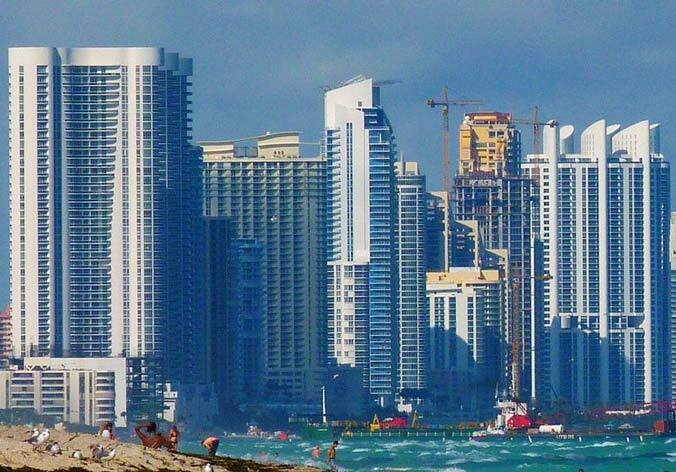 Buyers purchased an average of 140 condominium units per month in the Hollywood and Hallandale Beach areas showing an increase in 2011 of nearly 20 units per month from 2010. This is due to the influx of investors chasing discounted condo resales that can be leased out to tenants who are willing to pay higher rents. the pre-construction condo sector is also on the rise. Fueled by steady pre-sales at the nearby Apogee Beach Hollywood condo, Jorge Perez of the Related Group is planning more South Florida Construction on a new 31-story tower with condo and hotel units fronting the Intracoastal Waterway in the Hollywood nad Hallandale Beach coastal market of Southeast Broward County. Despite the unsold inventory, the Related Group broke ground on the 23-story Apogee Beach condo tower on the sand just north of Hallandale Beach Boulevard in December 2011. As of Jan. 30, 2012, buyers have committed to purchase 41 out of 49 units in Apogee Beach project, according to company marketing material. The path to development for the proposed Beachwalk tower – a few blocks west of the Apogee Beach project – is shaping up to be a bit more complicated initially. The proposed Beachwalk tower – which would stand 305-feet high with 84 residential units and 432 hotel rooms. Beachwalk is the 22nd project to be proposed east of Interstate 95 in South Florida. If they are all built, the projects would add nearly 4,400 units into a market that had 4,200 developer units unsold at the end of last year. A Related affiliate bought the Beachwalk development site, home to Manero’s Steakhouse for five decades, for more than $2.9 million from TD Bank in May 2011. The Beachwalk project is slated to cost $60 million to construct and have a market value of $80 million at completion. Related is also planning to start construction in two weeks on its MyBrickell condominium in Miami. To date, about 80 percent of the 192 units are under contract, with buyers paying a 20 percent deposit, the company said. It would be the first new condominium project to break ground in downtown Miami in several years. South Florida Construction Developers seeking to launch new condo projects are focusing particularly on the high-end market, which continues to dominate because of the ability of its prospective buyer pool to pay cash for units. The 70-unit Bellini Williams Island – a high-end condominium in Aventura’s William Island recently broke ground.